SOURCE: Brett Parkes, courtesy of Tourism Australia, the tourism promotion authority of the government of Australia, used with permission. 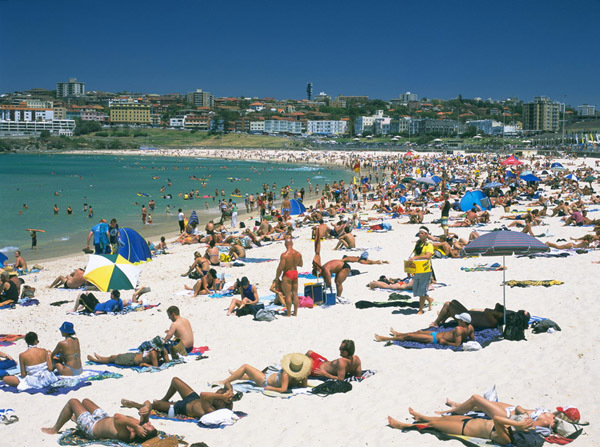 Bondi Beach is a popular beach and the name of the surrounding suburb in Sydney. It is located 7 kilometres east of the Sydney central business district, in the local government area of Waverley Council, in the Eastern Suburbs. Numerous festivals and events, such as the annual Miss Bondi beauty pageant, have made Bondi Beach a popular destination among travellers. There is also a skateboarding competition called Bowl-a-Rama which occurs in February every year.